Old fashioned courtesy can go a long way. And so, too, can snail mail. When I requested Ursula Le Guin to endorse my novel I used both. Last year my first novel, The Wedding Shroud, was published in Australia (and has now been released as an e-book world wide). The book is set in C5th BCE at a time when Rome was still scrapping for ascendancy over its Latin neighbours. The book compares the intolerant insular Romans with its enemies, the Etruscans, a people whose highly sophisticated civilisation spread throughout Italy and across the Mediterranean into northern Europe. My protagonist is a young Roman girl married to an Etruscan nobleman to seal a truce. Leaving behind a righteous society, she is determined to remain true to Roman virtues while living among the sinful Etruscans. Instead she finds herself tempted by a mystical, hedonistic culture which offers pleasure and independence to women. As an unknown writer I faced the daunting task of gaining publicity and credibility amid a plethora of new releases in the market place. My publisher suggested I have the book endorsed by a well known author. Sounded like a great idea. Only problem was to find one who would do it! My immediate thought was to find an historical fiction author whom I admired. There was no lack of these. I also thought it would be best if I could identify someone who was interested in the subject matter of my novel not just in history per se. 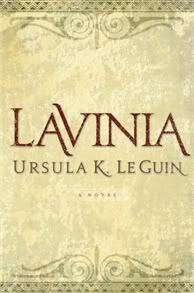 Around this time, a friend of mine mentioned that Ursula Le Guin’s Lavinia had been released to rave reviews. I was fascinated by this as I only knew her as the eminent author of amazing fantasy novels. I was also intrigued by the title of her book as I recognised it as the name of the wife of Aeneas, the hero of The Aeneid, an epic written by the Roman poet Virgil. I read Lavinia and was transported back to a time when Rome was yet to be founded and a war weary Trojan wanderer fell in love with the daughter of Latium’s king. The character of Lavinia is not developed in The Aeneid but Ursula Le Guin created a complex woman whose love for a stranger started a war. As a school girl I loved translating The Aeneid and it struck me that Ursula Le Guin must have a similar affection. In her Author’s Note I read how she had visited the area in Italy where ancient Latium was situated. Her delight in walking the same land upon which her characters had dwelt was clear. Her enthusiasm resonated with me. I also had dreams of standing in the ruins of Veii, the Etruscan city in which my novel is set. On the premise of ‘she can only say no’ or more to the point – reply with silence, I wrote her a letter. In it I explained how much I enjoyed Lavinia because of my fondness for Vergil’s The Aeneid. I also provided a one page synopsis of my novel and explained how I, too, wished to walk upon ancient land in reality as well as in my imagination. I have a vivid memory of hurrying to my local post office and asking for an international reply coupon before slipping the letter into the big red mailbox and crossing my fingers. To my utter astonishment, she responded only a few weeks later to say that she had always been fascinated by the Etruscans and would like to visit ancient Veii through reading my book. Imagine my excitement when she then agreed to endorse it! I still find it hard to believe she was gracious enough to reply let alone write a blurb.